Network Visibility « Global Market Insights, Inc. In this age of technology, increased accessibility to the internet has dictated the augmentation of the network traffic analytics market for monitoring and managing traffic, across different platforms in several consumer driven industry verticals. Traffic analysis is crucial in gaining detailed insights into the type of data that is flowing through a network, so as to have a better understanding of a business’ network utilization, connection speeds and the type of data packets. Providing the origin and destination of a transaction enables an enterprise’s IT system to identify any suspicious data packet, promoting the utility of the network traffic analytics industry. With the growing frequency of cyberattacks threatening to disrupt operations and data security in major organizations, the network traffic analytics market will experience a tremendous uplift through enhanced network monitoring solutions. Real-time data analysis has proven to be vital in ensuring fast detection and investigation capabilities of a company’s network handling system. The network traffic analytics market, boasting a valuation of over USD 780 million worldwide in 2017, has evolved accordingly to provide solutions for conducting analytics on real-time network information. Essentially, the breakdown of network traffic helps to establish a normal working pattern of an organization’s functioning, allowing easier recognition of components that seem out of the ordinary, like connection of any unregistered device or unusual traffic spike. Network monitoring, in a sense, adds a level of security against a probable event and enables the implementation of proactive safety measures. The BFSI sector, particularly, stands to benefit extremely from advancements within the network traffic analytics industry. Companies in the BFSI sector need to guarantee a reliable, safe and consistent service to retain customers, making them uniquely positioned among other industry domains. A network breach or downtime can result in distrust among the customers regarding the security of their savings, investments and private information. 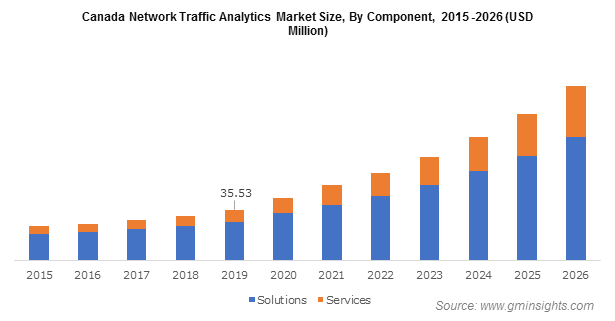 The network traffic analytics market comprises of solution providers that offer centralized monitoring systems to track, analyze and resolve network issues on not only physical but also virtual platforms. This is also necessary as many businesses in the BFSI sector have a number of units dispersed throughout a region, requiring efficient system for collating network data from all the locations and display it on an integrated dashboard. Similar to the thousands of external transactions that organizations such as banks monitor every day, even internal network and communication is prone to slowness, errors and malicious attacks, presenting a need for the services of the network traffic analytics industry. Network monitoring supplies extensive information on internal traffic, highlights slow applications and detects the presence of spywares that could jeopardize a company’s image. The ability to monitor suspicious activity assists in spotting outflow of personal information of customers which could lead to huge financial thefts through banking platforms. For example, in 2015 a bank in Kiev, Ukraine, was informed that their ATMs are dispensing cash without authorization, and investigation into the case led to the discovery that the bank’s internal computers are affected. Elaborating further, it was established that a malware had infiltrated their system that was permitting cybercriminals in different regions to access records pertaining to the behaviors of bank employees and how they conducted daily tasks. Reportedly, the criminals were able to also transfer millions of dollars from the U.S., Russian, Swiss and Japanese banks into their own dummy accounts. Effective analysis of network traffic to identify unfamiliar connections can help banks and other financial institutions to prevent such a disaster, implying the compulsion of the network traffic analytics market for providing network traffic monitoring solutions. The integration of new and innovative technologies with network monitoring and analysis systems will further improve their ability to measure performance metrics at granular levels, mitigate cyber threats and deliver faster return on investment. Lastline, a leading cybersecurity company, has recently introduced an AI-powered network traffic analysis solution. Representative of an emerging segment within the network traffic analytics market, which will create a smarter system for analyzing the traffic entering or operating inside a network. The solution applies AI (artificial intelligence) to the network traffic and could become one of the most effective threat monitoring technology available in the market. The AI network analysis solution identifies the initial point of infection, movement within system, along with every system that has been compromised by an attack, internal communication or external outflow of data. Lastline’s product can be expected to reinvigorate the network traffic analytics industry competition, as it is more accurate and efficient in making threats visible than manual monitoring, which can be affected by lack of experience and the load of a large IT network. All in all, the global network traffic analytics market, estimated to register a 20% CAGR from 2018-2024, will witness enormous growth from advanced traffic monitoring solutions. This entry was posted in Sustainable & Smart Technologies and tagged Cloud, Cloud Service Provider, Consulting Service, Integration and Deployment Service, Internet Service Provider, Managed Service, Managed Service Provider, Network Capacity Planning, Network Performance, Network Security, Network Traffic Analytics Market, Network Traffic Analytics Market Analysis, Network Traffic Analytics Market Report, Network Traffic Analytics Market Research, Network Traffic Analytics Market Size, Network Traffic Monitoring, Network Visibility, On-Premise, Telecommunication Service Provider, Training and Support Service.